The change in the relationship between sale and lease prices has complicated opportunities and decisions for some investors. The Gross Rent Multiplier is essentially an inverse look at that calculation: it’s the purchase price of a property divided by annualized gross rents. For GRM, lower is better. For comparison, a property for which monthly rent is 1% of the purchase price would yield a GRM of 8.3. 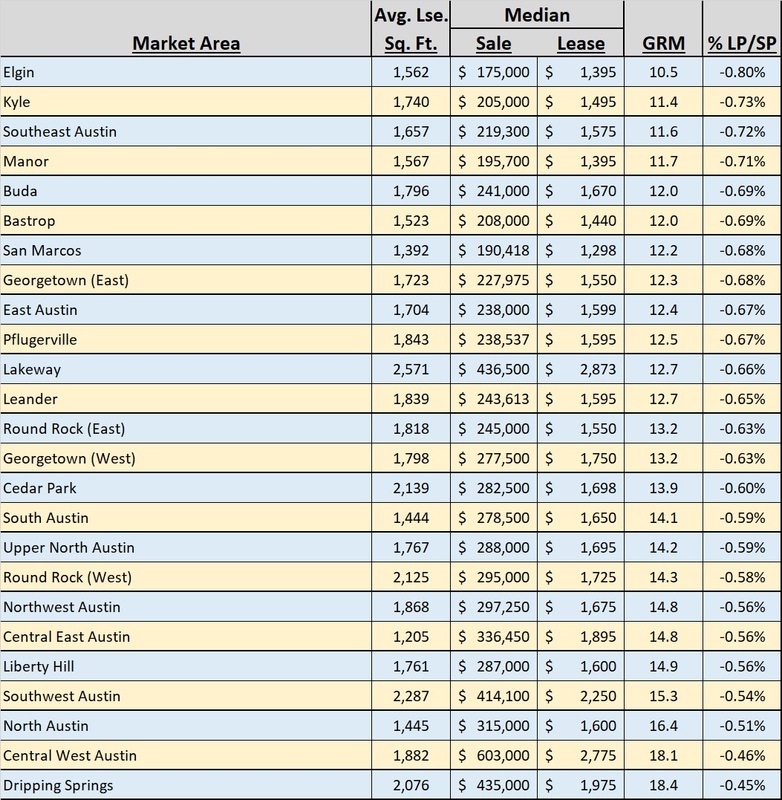 Does this mean that there are no attractive investment opportunities in North Austin or in Dripping Springs? Absolutely not! Nor do those calculations indicate that investment opportunities are everywhere in Elgin or Kyle or Southeast Austin. You might find a property in Central West Austin that will produce a GRM of 0.8 or 0.9, and you can almost certainly find properties in Manor that would yield GRMs of 0.5 or less if purchased as priced. There is a lot more to evaluating an investment than floorspace and gross rent and price — property condition, how it will be financed, property age, style, appearance and amenities of the surrounding area, likely price appreciation in the area over the investor’s planned holding period, specific location (busy corner or quiet cul de sac), demographics or crime statistics in the neighborhood, coming changes in and around the immediate area, access (major thoroughfares, public transportation, etc. ), and more. Every investor has his or her priorities, property management style, risk tolerance, and target market, and with experience comes to understand the financial trade-offs that may be required by a chosen strategy. There are also many other financial tools available — Capitalization Rate, Return on Investment (ROI), Internal Rate of Return (IRR), Cash-on-Cash return, and more. If you’re in the market for real estate investments, think carefully about what you want to accomplish, when you want to accomplish it, what you’re willing to do to accomplish it, and what ultimate return you need, short- and long-term. The information I’ve provided here won’t guarantee making the right decision on any specific investment, but it might help to guide your search. I hope it is helpful.